Syllabus of the Online Course (Subject): African Growth and Opportunity Act (AGOA) - The United States. 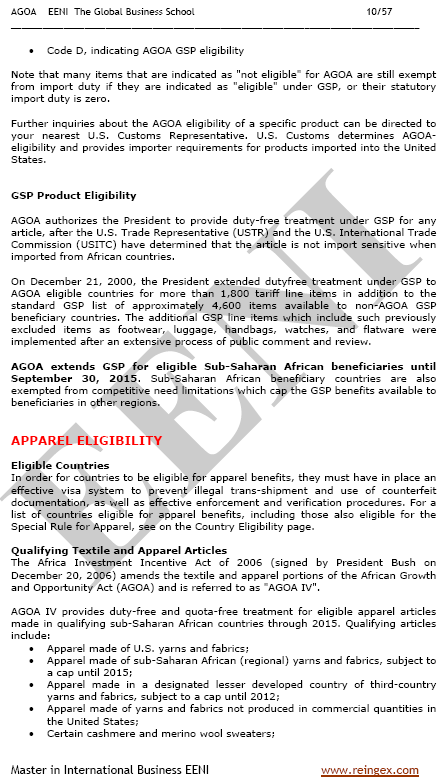 Description of the Online Course: African Growth and Opportunity Act (AGOA). 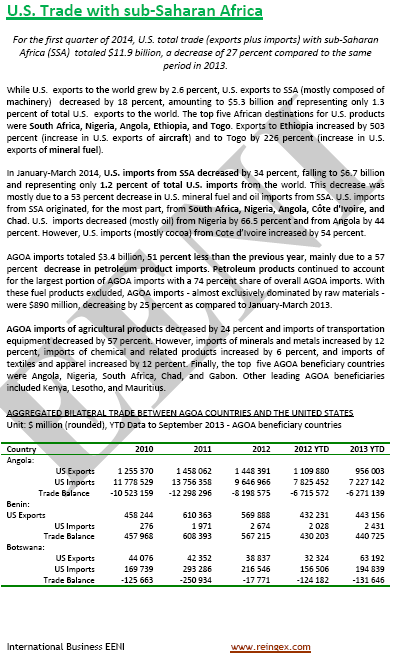 The African Growth and Opportunity Act (AGOA) is a U.S. Trade Act that considerably enhances the United States Market Access for forty Sub-Saharan African Countries. The countries eligible for the African Growth and Opportunity Act (AGOA) are Angola, Benin, Botswana, Burkina Faso, Burundi, Cameroon, Cape Verde, Chad, the Comoros, the Republic of the Congo, the Democratic Republic of the Congo, Djibouti, Ethiopia, Gabon, the Gambia, Ghana, Guinea, Guinea-Bissau, Ivory Coast, Kenya, Lesotho, Liberia, Madagascar, Malawi, Mali, Mauritania, Mauritius, Mozambique, Namibia, Niger, Nigeria, Rwanda, São Tomé and Príncipe, Senegal, the Seychelles, Sierra Leone, South Africa, Swaziland, Tanzania, Togo, Uganda, and Zambia. 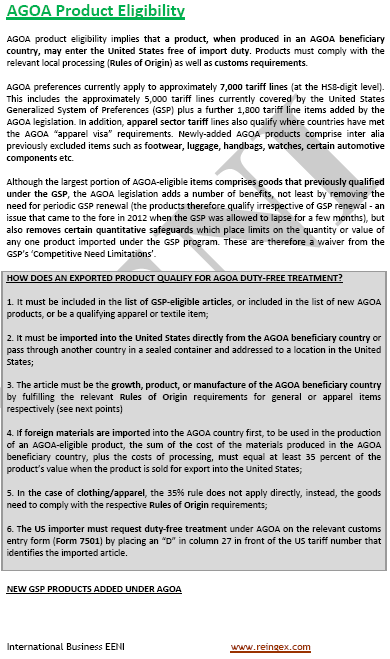 The countries not eligible for AGOA are Zimbabwe and Sudan. 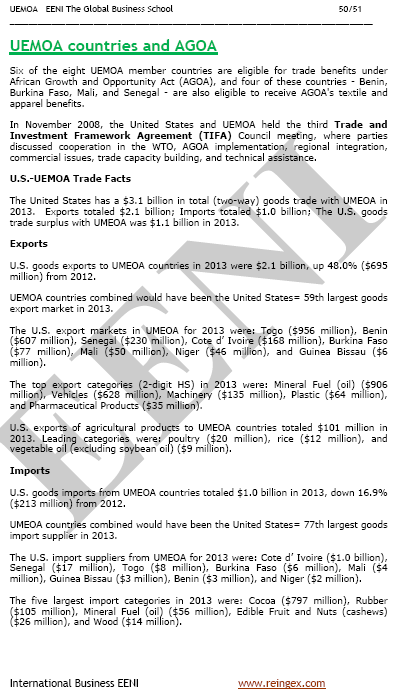 The African Growth and Opportunity Act (AGOA) passed as a part of the Trade and Development Act (2000) provides to beneficiary countries in Sub-Saharan Africa with the most liberal access to the United States Market available to any nation or region with which the United States do not have a free trade agreement (FTA). The AGOA strengthen the African reform efforts, provides improved access to the United States, credit, and technical expertise, and create a high-level dialogue on foreign trade and foreign direct investment (FDI) in the form of a United States-Sub-Saharan Africa International Trade and Economic Forum. The Africa Investment Incentive Act (2006) amends parts of the African Growth and Opportunity Act (AGOA) and is referred to as “AGOA IV.” The AGOA extends GSP (Generalised System of Preferences) for eligible Sub-Saharan African beneficiaries. Since its beginning in 2000, the African Growth and Opportunity Act (AGOA) has contributed to increasing foreign trade with Africa and diversify the range of exported products. Bilateral investment treaty (US-African Countries): Rwanda, Mozambique, the Republic of the Congo, the Democratic Republic of the Congo, and Cameroon. 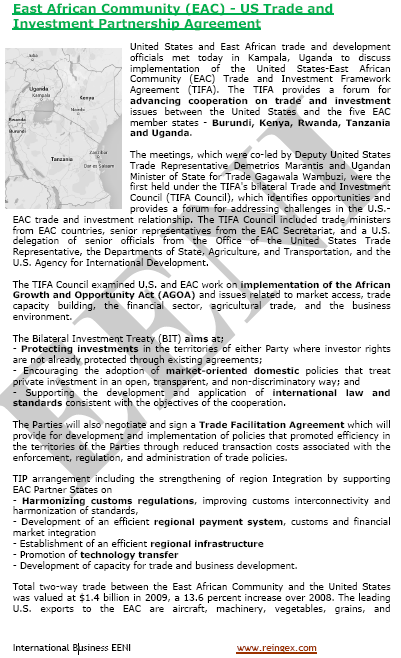 Trade and Investment Framework Agreements (TIFA): Angola, Ghana, Liberia, Mauritius, Mozambique, Nigeria, Rwanda, and South Africa, the Common Market for Eastern and Southern Africa (COMESA), the East African Community (EAC) and the West African Economic and Monetary Union (WAEMU). North American area of Western Civilisation.